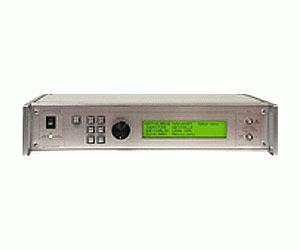 The AV-153A series of high-power, high-voltage function generators allow sine, square, and triangle waveforms to be generated at amplitudes to +/- 200V and frequencies to 300 kHz, into loads of 5 kilohms and higher. These instruments also have a variable-gain linear-amplifier mode, which allows more complex waveforms (amplified from a low-voltage arbitrary waveform generator, for example) to be generated. The AV-153A-B model provides sine wave, square wave and triangular waveforms at frequencies as high as 300 kHz with peak amplitudes as high as ±200 Volts (i.e. 400 Volts peak-to-peak) to loads of 5 kΩ and higher, with average output powers as high as 15 Watts. The closely related AV-153AH-B can operate into loads of 1.2 kΩ and higher, with average output powers as high as 50 Watts. pulse waveform that swings from zero Volts to a positive voltage. The pulse width is adjustable. The maximum pulse duty cycle is 80%. A DC offset feature is also included, which allows the waveforms to be shifted by an adjustable DC voltage. Instruments with the -B suffix also include a complete computer control interface. This provides GPIB and RS-232 computer-control, as well as front panel keypad and adjust knob control of the output parameters. A large backlit LCD displays the output amplitude and frequency. An Ethernet port for Telnet-based control is optional. by pressing a front-panel pushbutton, or by computer command.